I love using plain paper bags to make a big impact! 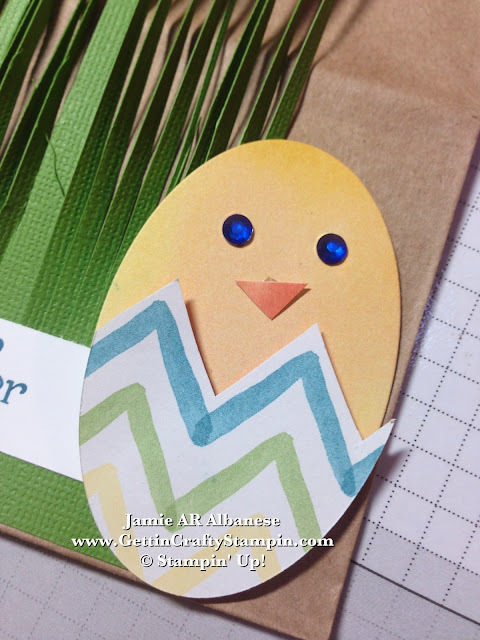 This cute Eater Chick punch-art bag is a fun way to deliver Easter Eggs (or ideal for kids to hunt said eggs) or to deliver Easter treats! Inspired by my friend Georgia and her punch-art Easter chick card.. this bag is sure to deliver smiles. * Gumball Green is one of the IN-Color collections that are going away! Grab YOURS this week as the release the Retired List and Stampin' Up! offers FREE SHIPPING (April 21-25). Create this cute punch art chick as it hatches from this decorated egg with two punches of the Oval Framelit on the Big Shot Magnetic Platform and Big Shot Die-Cutting Machine. This Watercolor Wonder Designer Series Paper is double sided with these two patterns on one page! 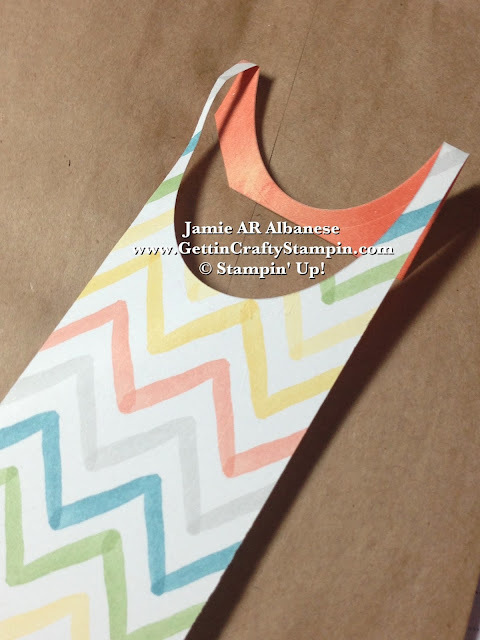 Follow this zig-zag pattern on one side for a cute decorated egg look. This chick has the cutest shading (like a blush) and creates a 'beak'. Color the adhesive backed Rhinestone Jewels with a blue bic/sharpie permanent marker and these cute eyes are sure to capture your heart with a sapphire blue jeweled look. Stamp this cute 'Happy Easter' from the Delightful Dozen stamp set with Island Indigo ink on the Whisper White card stock. Trim these ends with your Paper Snips for a ribbon look and curl them with your Bone Folder. 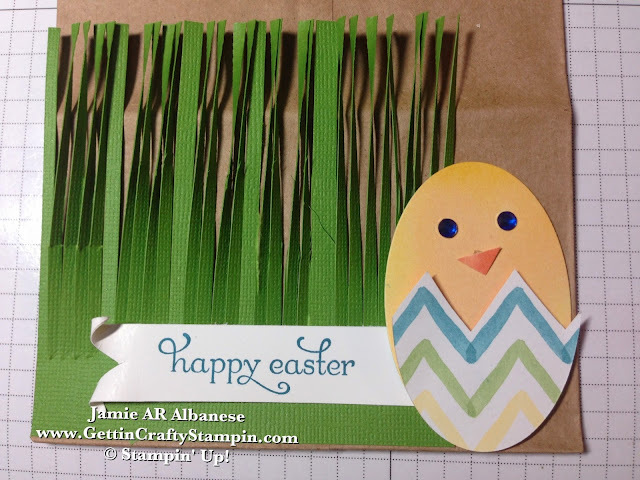 Layer this Punch-Art chick over this Fringe Scissor 'grass' cut from the Gumball Green (In-Color, and soon to go away but oh-so-pretty paper). Deliver smiles with this Punch-Art Easter Egg and Chick gift bag. 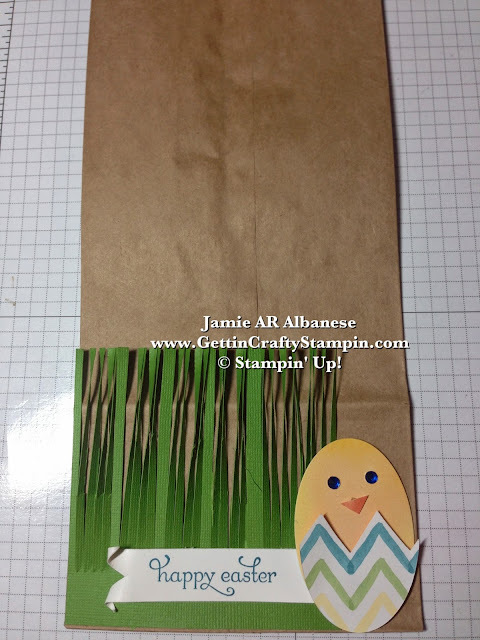 Taking a plain lunch sack and turn it into a colorful Easter bag (perfect for an Easter Egg Hunt or to deliver some Easter goodies). Inspired by my friend Georgia, this gift bag is sure to deliver some Easter cheer.